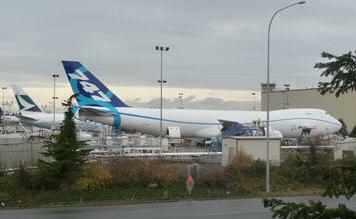 October 2, 2010 - Boeing announced a schedule change for the 747-8 Freighter with first delivery now expected mid-year 2011. The company also announced steps it is taking to support the new schedule, including adding a fifth airplane to the flight-test fleet. The company previously indicated that, following recent flight-test discoveries, there was a high probability the first 747-8 Freighter delivery would move into 2011. The new delivery schedule follows a thorough assessment of the expected cumulative impact of these discoveries, which include a low-frequency vibration in certain flight conditions and an underperforming aileron actuator. While neither issue requires structural changes to the airplane, they have led to disruptions to certification testing, which the program was unable to offset within the prior schedule. This schedule change is not expected to have a material impact on Boeing's 2010 financial results. The 747 has proven to be a very popular freighter, carrying around half of the world's air freight as of 2007. In an effort to maintain this dominant position, Boeing designed a freight variant of the 747-8, named the 747-8 Freighter or 747-8F, which was launched on November 14, 2005. The 747-8F will be the initial model to see entry into service (EIS). As on the 747-400F, the upper deck is shorter than passenger models; the 18 feet 3? inches (5.575 m) stretch is just before and just aft of the wing. With a 975,000 lb (442,000 kg) maximum take-off weight, it will have a total payload capability of 308,000 lb (140,000 kg) and a range of 4,390 nmi (8,130 km). Four extra pallet spaces will be created on the main deck, with either two extra containers and two extra pallets, or three extra pallets, on the lower deck. The 747-8F is expected to achieve a 16% lower ton-mile operating cost than the 747-400F and offer a slightly greater range. The 747-8F will have more payload capacity but less range than the current 747-400ERF. When Boeing launched the 400ERF, all of the 35,000 lb (16,000 kg) increase in MTOW over the 747-400F 875,000?910,000 lb (397,000?410,000 kg) allowed airlines to take off with more fuel, burn it during flight, and land at the same weight as the regular 747-400F. This increased the range of the 747-400ERF compared to the 747-400F. Cargo carriers often move machinery or indivisible loads that require a plane with a higher payload and landing capability. As is common with cargo planes, range is given with maximum payload, not fuel. The 747-8's 65,000 lb (29,000 kg) MTOW increase has been directed exclusively to its Zero-Fuel weight or payload capacity. If taking off at maximum payload, the 747-8 takes off with its tanks not full. On trips where the payload is not at maximum, the plane can take on more fuel and extend its range. Cargolux and Nippon Cargo Airlines were the first customers for the 747-8, placing orders for the freighter variant in November 2005. The first scheduled delivery of the 747-8 will be to Cargolux in the fourth quarter of 2010. The firm configuration of the aircraft was finalized in October of 2006. Major assembly of the aircraft began on August 8, 2008, and the aircraft first left Boeing's Everett factory on November 12, 2009.